Iron driveway gates are impressive and gorgeous, and they help keep your home secure and free from unwanted visitors. What’s not to love? 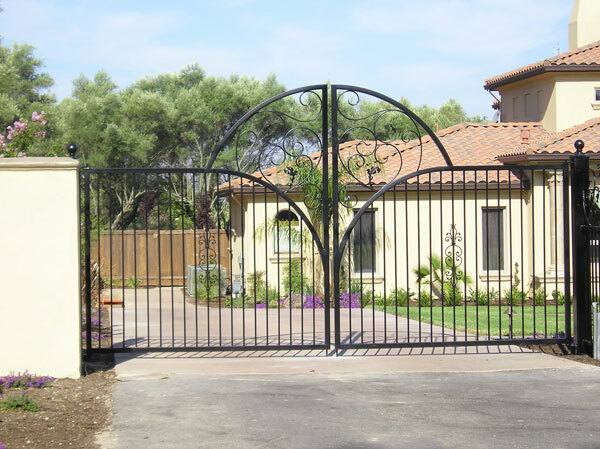 If you are thinking about getting iron driveway gates for your Sacramento, CA home or business, here are a few of the things that you will need to consider. First, is your driveway long enough? There needs to be enough room to drive in from the road without getting your car hit while you wait for your gate to open, and to drive out of the gate and wait for a gap in traffic without having the gate close on your car. Inside the gate, there also needs to be enough room to make sure the gate does not damage your car, though if there is not enough room for a swing gate you can also choose a sliding gate or a lift gate for this purpose. Second, will your neighbors be able to get out safely? Driveway gates often have relatively large pillars on either side, and it is important to make sure that these pillars will not block your neighbors’ view as they pull out of their own driveways. Our installation and design experts will make sure that this is the case, though, so with Linmoore Fencing you do not ever need to worry that your driveway gates will be installed wrong or will cause problems in the future. Third, what safety measures do you need? For people with pets and small children, this is a very important consideration, and we have a variety of options to protect those you love, both two-footed and four-footed. For instance, you can have a detector on the gate that stops the gate’s motion if an object over a certain weight is in the way. This way, if a pet or a child is in the way of the gate, it will not be crushed or injured. You can also have a motion detector installed, which is the best option if your pets are smaller than can be detected by a weight sensor. This way, the gate will not close if something is in the way that is detectable by a motion sensor.